The focus was on plant viral diseases transmitted by way of insects and nematodes, and the efforts being made by national agricultural research bodies to identify and manage these vectors. Scientists from Agriculture & Agri-Food Canada, the United States Department of Agriculture and Instituto Nacional de Investigaciones Forestales Agricolas y Pecuarias got together in Merida, Yucatan, Mexico to discuss common pest and diseases affecting crops important to all three countries. The focus was on plant viral diseases transmitted by way of insects and nematodes, and the efforts being made by national agricultural research bodies to identify and manage these vectors. Reduced production yields and the increasing incidence of quality defects in crops such as tomatoes, hot peppers, strawberries, watermelon and Honey Dew melon cause an economic burden on producers and drive the need for continued scientific research. Whiteflies and aphids were identified as the usual culprits for carrying the viruses to plants, although humans are also sometimes to be blamed. Results of ongoing research using state-of-the-art technologies for identifying the presence of new and emerging plant viruses such as the Grapevine Red Blotch Virus and the Sweet Potato Symptomless Virus were shared at the recent meeting. Government researchers and scientists from various locations in the USA, Canada and Mexico were pleased to interact with the many students present as well as university Faculty members and representatives of the Mexican Regulatory body, SENASICA. The 2-day meeting was organized by the Plant Health Task Force of the trilateral platform, PROCINORTE, as part of its on-going commitment to promote sustainable management of pests, diseases, nematodes, and weeds that negatively affect crop production in North America. 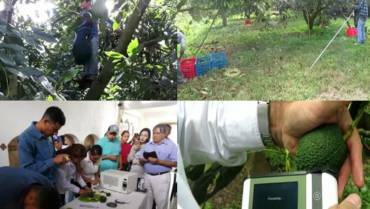 PROCINORTE is comprised of the national agricultural research bodies in the USA, Mexico and Canada and its Secretariat is provided by the Inter-American Institute for Cooperation on Agriculture.